Slow down. Listen to yourself. Are you caring about the way you communicate with others? Are you connecting with people around you in a meaningful way? Are you allowing yourself to be vulnerable? Are you called to listen more to your body and how you express through it? Are you interested in exploring what getting closer to nature can lead to? Are you aware of your language patterns?Are you willing to dig deep into your way of communicating with others and explore how to make it more effective? Are you in touch with what is meaningful for you? In Care to Communicate you will have the context to explore the answers to these questions through an experiential learning approach in which you will be the creator of your own experience, guided by the facilitators and supported by the group. Your individual learning process will take place in a safe space and in a community-oriented and group-supported environment. 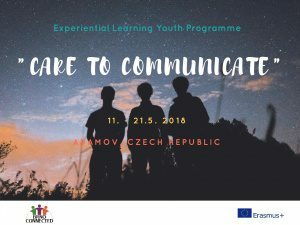 The project is funded through Erasmus+ programme which means that food, accommodation, programme, materials and travel costs according to the given distance bands (check infoletter) are fully covered.